Kanchivaram is a slice of life social drama that largely rests on an excellent performance by Prakash Raj. Priyadarshan eschews the broad almost hyper style more common in his Hindi comedies and delivers a thoughtful and subdued film. The film opens with a prelude explaining the significance of wearing silk at marriage and on death, and that the weavers were never in a financial position that would allow them to wear the fabric they wove. Vengadam (Prakash Raj) is an exceptional weaver and a natural leader in his community. A visiting writer (Sreekumar) introduces the village men to communism. Vengadam initiates collective bargaining for the weavers, which leads to a lengthy strike. But he had also promised that his daughter would be married in a silk sari, impossible to manage when he is not working. He steals silk, a hank at a time, and secretly weaves the sari he promised her. The conflict between his political and personal ideals and his love for his family is the root of the story. The story is presented as a series of flashbacks. Vengadam is paroled from jail and travels back to the village by bus, with sounds and incidents on the journey triggering his memories of earlier times. This structure allowed me to concentrate on what was happening now, and to absorb the emotion of the story rather than wondering what would happen. His story unfolds from his marriage, birth of his daughter, the death of his wife and eventually the reason for his incarceration. The breaks in the flow as Vengadam was recalled to himself on the journey just sharpened the contrast between the bluff confident weaver and the broken man on the bus. Priyadarshan frames the story in the political context of the rise of Communism before party membership was legalised. He efficently sets the scene of the industrial arrangements, the workers dependency on the factory, the clandestine political activism, in just in a few scenes. There are visual cues as to how things stand. The factory owner usually appears sitting or standing on a dais at a higher level than the workers. The communist writer who raises the political awareness of Vengadam and Sarathy skulks around in the dark, fearful of the police. I’m always interested in industrial relations and the evolution of employee rights and the law so that aspect was appealing. And I particularly liked the villagers reaction to some social theatre – initially passive but on their feet and cheering like any mass movie audience when the ‘blood’ spatter started. Prakash Raj is wonderful as Vengadam. Whether playing the younger carefree newlywed or the damaged man released on parole he is completely convincing. Vengadam has most of the dialogue in the film but many scenes rely purely on reactions and body language and Prakash Raj nails it. Often political leaders are depicted as single minded zealots, but Vengadam is more human. He understands his why wife is upset by the promise to see his daughter married in silk. He realises his daughter is in love with Ranga and goes to ask for the marriage to be arranged. He knows that when he takes a stand and strikes there will be consequences. And he knows what he is doing when he breaks the strike. Prakash Raj shows these internal struggles and questions and Vengadam’s eyes reflect his turmoil. I’m often intolerant of those who throw their families or friendships under the bus of ambition but this is more complex as Vengadam is not motivated by pure selfishness. He stole silk to weave something beautiful for his daughter, to break the cycle of not having. I could like him even as I rolled my eyes at his obsession with the sari. 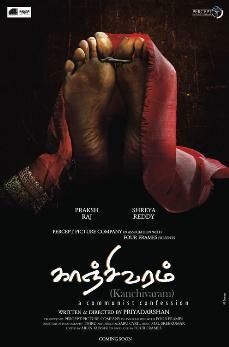 Shriya Reddy is excellent as Annam, Vengadam’s wife. Priyadarshan seems to have a knack for persuading actresses to tone down the glamour (as with Lara Dutta in Billu). Annam is smart, has opinions and politely challenges her husband in private when she thinks he has gone too far. From the initially awkward moments when Annam first comes to her new home, Shriya shows the growing affection and the playfulness in the marriage. Annam doesn’t have much dialogue so much of their closeness and the tensions in the relationship had to be conveyed through glances, the tilt of a head, the set of her shoulders. She dies after being trampled in a crowd out to see the landlord’s new car, another symbol of the gulf between the workers and owners. Her final anguish is over whether Vengadam will be able to raise their daughter and he does his best to reassure her in his own way. Family and village ties are revealed in many small interactions so the supporting cast are important and most are very good. I particularly like Jayakumar as Sarathy, Vengadam’s friend and one-time political ally. His rapport with Prakash Raj was excellent, and their friendship felt believably warm. I liked their stilted meeting to discuss getting their children married to each other that ended in affectionate hugs and relieved laughter. The deterioration of their relationship was shown simply but the pain on both sides and the definitive nature of the break was clear. Shammu is engaging and likeable as Vengadam’s daughter Thamarai. I do a certain amount of teeth gritting when I see little daughters made to replace their dead mothers in the home, but Thamarai was a distinct person and not just a household slave. She went to school for a while, then took sewing lessons, and her dad wanted her to be happy. So for a filmi girl in 1948 with no Ma, I thought she had it pretty good. Until things went wrong. There is an English character played by a truly bad actor. Well, I am not sure if the brightly over-enunciated yet almost expressionless dialogue delivery is his own style or was required by the director. There are so many good actors working across many Indian film industries yet the ‘English’ are almost uniformly laughable and seem to be reading at a pre-school level. Who is casting these people? The colour palette is simple and very effective throughout. The day to day scenes are muted and mostly use neutral and earth tones. The bus trip is drenched in the pale blues and grey of rain and twilight. Scenes at night are touched with the golden flicker of lantern flames. The flash of opulent silks highlights the gulf between the weavers and the eventual owners of those stunning garments, and punctuates the drama with bursts of saturated jewel tones. There are recurring motifs like the sickle, used as an emblem of communism and as a blade. Thiru’s camerawork uses lots of tight close ups of the actors and despite the dark interiors and low lighting in some scenes he catches every expression and gesture. Despite the period and politics of the setting, Kanchivaram can be watched as a personal and intimate story rather than a didactic message film so I was impressed by his handling of those elements. But I’m not completely sold on the ending. The sensitivity of the characterisation and performances is what stands out for me. The film is available on YouTube with subtitles. 3 ½ stars! This entry was posted in Kollywood and tagged Jayakumar, Kanchivaram, Kollywood, Prakash Raj, Priyadarshan, Shammu, Shriya Reddy, Tamil, Thiru. Bookmark the permalink. One of the most amazing films I saw. Priyadarshan’s excellent direction, Tirru’s fantastic Cinematography, Prakash Raj’s memorable acting makes the film truly amazing. I liked the film a lot and the negative ending too. It was needed for the impact to be created on a normal film viewer. I’m watching the film for a 4th time on TV. And the film never bores me. And I love the visualization of the film which is normal for a period film but scenic in its own way.